Wilwood’s SRP Rotor and Lug Drive Hat Assemblies are preassembled packages of our latest and greatest technology and design. The lug-drive rotor mounting system eliminates the rotor bolts and instead, a large single internal snap-ring retains the rotor in the hat. This system allows the rotors to move independently of the hats as they expand and contract through heat cycles. All thermally generated stress is removed from the rotor attachment points. The rotors stay flatter and run truer. Paired with SRP Drilled Performance rotors that are manufactured from a proprietary iron alloy developed to withstand extreme temperatures with the highest possible degree of resistance against distortion, warping, cracking, and wear. 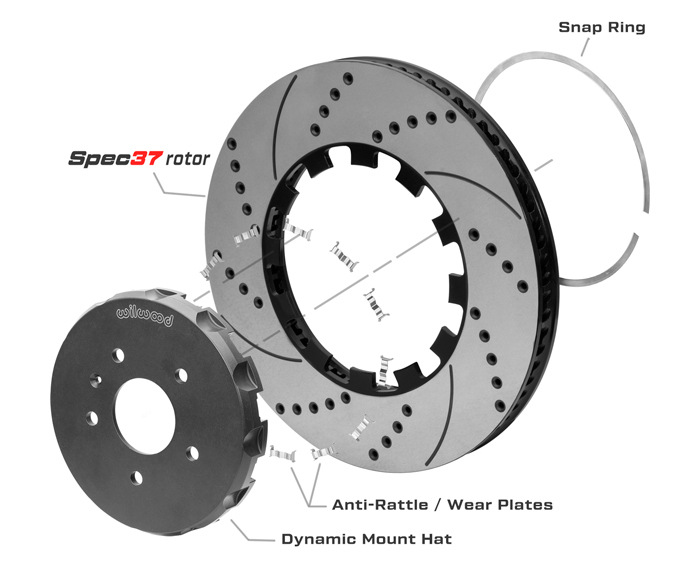 SRP Drilled Performance Rotors feature a specially engineered directional cross drill and face slot pattern that improve brake response and pad performance throughout the entire range of light to heavy braking. The venting and cleaning action of the holes and slots will reduce pad glaze and disperse gasses and heat generated during the pad to rotor interface.